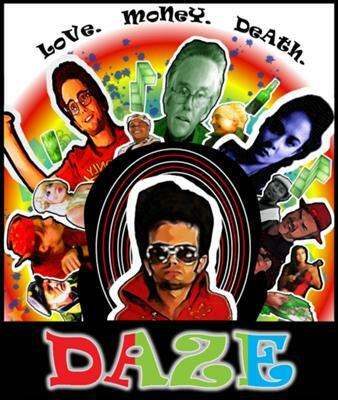 Daze is an arthouse film about love, death, and money with a very interesting visual style. The project has already been shot and good portion of post production is done. We need finishing funds and are looking for a last in first out investor for $75,000. Now here's the good part. The film stars Jackson Rathbone ("Twilight", "The Last Airbender") and Gary Busey (Academy Award Nominee for "The Buddy Holly Story"). We're talking to Sales Agents and are considering presaling some foreign regions to get the rest of the funding however, we'd like to retain those rights until we go to a film festival. Regardless, knowing that we can easily recoup the last in investors money using foreign sales makes its a fairly safe bet. Remaining post production would be finished in a few months and ready for film fests. Daze takes place over three days told nonlinearly alternating scenes from the three days. Each day has a different visual style, color, and theme. The red day is about love, the green day is about money, and the blue day is about death. A radio contest provides a series of events that juxtapose the struggle to obtain these three things and the bizarre ways in which they might just happen. The red day is about, Rich, a silent character (that no one mentions) who wears a red elvis jumpsuit, goes to work like any other day but experiences the whole day in a dreamlike animated way. The entire day is shot on green screen or uses green screen objects. Rich works in a large office building with an indeterminatable but loathsome job. Richs dreamlike way of seeing the world makes the receptionists into djs, the janitors into break dancers, and the business men - pimps, the woman look like theyre at a club or the red carpet. Rich discovers a mysterious door to a room no one knows about and sets about on laborious and vague opus like project. Hes in love with Amy and struggles with the overwhelming feelings he has for her (partially why hes silent, the other reason is because well a lot times people say things to you that there really is no reply to). Richs roommate Jehosephat, spends his day lounging around, popping in once in a while to spout nonsense and hanging out with his girlfriend Michelle while they discuss the inner workings of a relationship (Jehosephat is actually the projection of Richs voice that he wishes he could say and Michelle partially represents the way he sees Amy). The green day has a lot of feedback and scratchiness to the sound. A very blown out white look visually. It centers around Mr. Morris and the various bizarre business proposals and products hes trying to pitch to a variety of investors (these include but are not limited to a scent coded system for parking lots since scent is the sense most related to memory, personalized dildos, and ostrich farms). Mr. Morris is Amys boss. Hes also a huge drunk who consumes a disgusting amount of alcohol. Mr. Morris is struggling to get just one investor to keep his business afloat. Amy is the center of the last day, the blue day about death. A nasty breakup with her boyfriend as well as other circumstances, some known, some unknown, cause her to attempt suicidemultiple times. Pills, drowning, co2 poisoning, strangulation. Her situation becomes depressing and comical in its absurdity. A final attempt culminates in a passive confrontation. The day is shot in black in white except for some blue objects which will be blue. All of these days are intertwined and told together with the contrasts of each highlighting the others. Each day is full of bizarre and hopefully interesting characters and dialogue that help make the story seem more real and unreal as much as possible.